Using ultrasound technology to “see” inside the trunks of two sick trees at Davis House near the McIntyre Medical Building, McGill’s tree experts determined that the trees are weak and sick and must be taken down. They will be replaced with two red maples; native species better adapted to their environments, said Eric Champagne, Horticultural Supervisor in McGill’s Department of Facilities, Operations and Development. 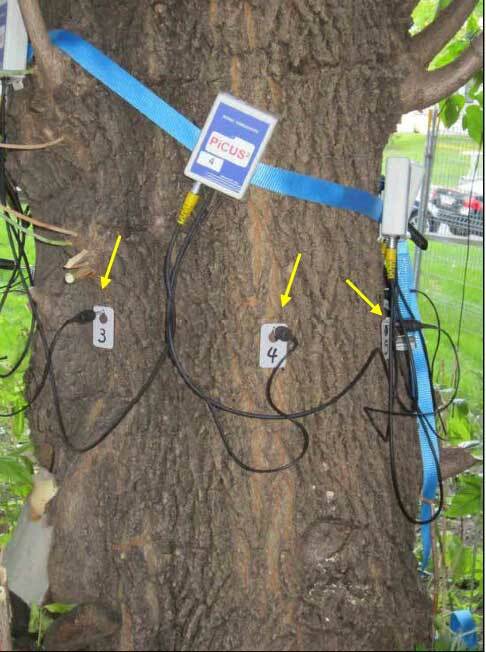 Ultrasound sensors on a Manitoba Maple tree at Davis House allowed tree experts to "see" inside its trunk. Using ultrasound technology to “see” inside the trunks of two sick trees at Davis House near the McIntyre Medical Building, McGill’s tree experts determined that the trees are weak and sick and must be taken down. They will be replaced with two red maples; native species better adapted to their environments, said Eric Champagne, Horticultural Supervisor in McGill’s Department of Facilities, Operations and Development. One of the trees, known popularly as a Manitoba Maple, is a “weed tree” that causes problems across the Island of Montreal, Champagne said. It’s considered an invasive species, grows quickly, but is known to be short-lived and fragile. “A few years ago, one fell on five cars parked near the McConnell Arena,” Champagne said, and another produced a close call for a group of men working on an electrical panel when a large branch cracked and nearly fell on them. In the present case, fungus has chewed up the interior of the trunk and the tree is in danger of falling. The other tree to come down early next week at Davis House is a butternut that probably grew from seed and has not been growing in ideal conditions in shallow soil. It, too, is beyond hope. The City of Montreal has approved the removal of both trees, Champagne said. Fungus at the base of the Manitoba Maple. centimetres deep, depending on the species; the rest of the trunk is effectively dead. 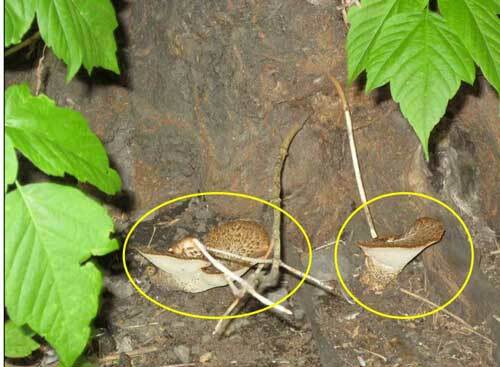 When the dead part becomes rotten, from insects or fungus or simply old age, the tree weakens and becomes a hazard. McGill engaged an outside arborist, Luc Nadeau, to consult on the state of the trees. McGill has a vast collection of trees, especially when one includes the Morgan Arboretum on the West Island, and is custodian to what is probably the largest collection of old trees on Montreal Island, Champagne said. But what grows up must, eventually, come down. The University normally has to cut down up to 10 or 12 trees a year because of disease and hazard, but replaces them with appropriate species, he said. Sometimes, it’s heartbreaking. The return of an aggressive strain of Dutch Elm disease doomed three gracious elm trees between Douglas Hall Residence and Molson Stadium, Champagne said, expressing genuine sadness over their plight. Hybrid elms resistant to the disease have been planted there and are doing well, he said. But threats continue. The recent arrival of an insect called the Emerald Ash Borer has brought a new menace to hundreds of ash trees on Montreal Island, including some on McGill’s campuses.